Second-year Ohio State head coach Chris Holtmann watched his team suffer its fifth straight loss Wednesday night, this time to Purdue in Value City Arena, dropping the Buckeyes to 2-5 in conference play. The recent rough patch features acceptable losses to No. 8 Michigan State and even No. 19 Maryland despite both being at home and of course losing at Iowa was an ugly game but winning roadies in league play is always a tall task. 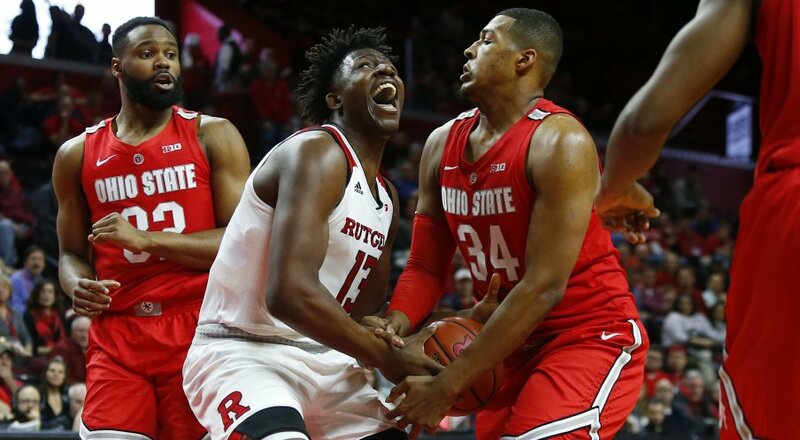 That reality certainly came into focus in the second game of the streak as the Buckeyes dropped really the only inexcusable contest of this month-long struggle, falling to a Rutgers squad that currently sits at 2-6 in conference action. The losing streak comes on the heels of a 12-1 start that had most of us thinking there was a damn good chance Holtmann could pull a rabbit out of his hat and get this particular roster to the NCAA Tournament on the heels of last year's much better roster reaching the second round before bowing out to Gonzaga. Look, this isn't about trying to slight players but if we're being real, losing veteran leaders Keita Bates-Diop and Jae'Sean Tate has come into sharp focus this month. The only real veterans left on the roster are quality guys who play their asses off but experienced names like C.J. Jackson, Keyshawn Woods and Andre Wesson simply have limitations far exceeding those of Bates-Diop and Tate. Factor that in with Micah Potter's transfer on the eve of the season opener and Kyle Young's injury and you have a team forced to rely way too much on a talented pivot in Kaleb Wesson and a host of inexperienced guys including freshmen Luther Muhammad, Duane Washington Jr., Jaedon Lee and Justin Ahrens, and sophomore Musa Jallow. An honest assessment of where each player is at in their development curve versus their likely ceiling while examining the last five opponents provides more perspective into the skid. If you're frustrated, keep in mind that some of the young guys, specifically freshmen Muhammad and Washington Jr. are going to evolve into veterans that will most likely far exceed the ceiling of some of the current vets, and sophomores Young and Jallow have already shown growth from a year ago. If this team drives you nuts, remember it hasn't shown an ounce of quit during a humbling month. That said, there are also some valid complaints that Holtmann and his staff need to address that aren't exclusively about talent. Their balls-to-the-wall mentality backfires thanks to undisciplined effort that sees them sometimes grossly overplay passing lanes, crash the boards or drive the lane in a reckless way or in the case of Kaleb Wesson, refuse to give up an easy bucket or entry pass at certain points, especially early in the game, to avoid risking foul trouble that his team simply cannot afford. Valuing the basketball is maybe the biggest opportunity as the Buckeyes trail only Illinois in turnovers per game in league play with 14.0 per contest. Another huge pain point is the fact Holtmann's team can't get to the stripe. Through seven Big Ten games, the Buckeyes have attempted 59 less free throws (8.4 less per game) and been outscored by 50 points. Fifty. So where does Holtmann go from here? He maintains the culture he rebuilt, continues working on Kaleb's foul troubles, doesn't shelve seniors Jackson and Woods by any stretch but if a few more losses pile up, he transitions even more minutes to Muhammad, Jallow, LeDee and Ahrens, and keeps Washington Jr. in the starting lineup. Hell, even if losses don't pile up he follows that formula. It's not far-fetched to think this roster can put things together and still make a run at the Dance but the real litmus test for Holtmann starts this summer when incoming freshmen DJ Carton, E.J. Liddell and Alonzo Gaffney arrive in Columbus. Adding three of the top 36 blue chips in the country to what should be more-polished versions of Kaleb, Andre, Muhammad, Washington Jr., Young and Jallow, in particular, should give Holtmann a real chance to win the Big Ten and make a deep run in March. For now, don't get caught giving up on this team but if things do get out of hand over the next few weeks, realize Holtmann knows the cupboard will be restocked soon and will have one eye on preparing his existing guys to complement the new pieces on the way. Year Three is when Holtmann's legacy at Ohio State will start to take shape, one way or the other.